Thousands of happy Homecoming fans left Hailey's Phil Homer Field with miles of smiles Friday because the streaking Wood River Wolverines defeated the Jerome Tigers 35-22 in an exciting Great Basin Conference football showdown. Senior Greg Lindbloom rushed 16 times for a season-high 212 yards and three touchdowns. The Wolverines used their "rocket" end runs in the first half and inside running after intermission to pile up 382 yards on 43 rushes before a standing-room-only home gallery for Homecoming. Wood River (4-1, 1-0 league) captured its fourth consecutive win and only fifth victory in the 39-game series with Jerome dating back to the 1960s. The 35 points were the most points a Wolverine grid team has ever scored against a Jerome team. Co-captain Lindbloom said, "We wanted this game. Everybody came to play. We had our setbacks but never gave up. In the first half we used our 'rocket' end runs and outside plays. The success of those outruns set up our inside running game in the second half. "I felt our defensive backs rose to the challenge of stopping Jerome's passing game." Senior lineman Jake Vegwert said, "This is only the fifth time in 39 years that a Wood River team has beaten Jerome, and we feel honored to have done that. Our seniors decided we wanted to be a good team this year—and we wanted Jerome for our Homecoming. "Every kid out there played 100% tonight. We attribute a lot of our stick-with-it approach to our coaching staff, who bring a great deal of spirit to us." Third-year coach Kevin Stilling said, "We talked all week about approaching this as we would any other football game. But it was a big deal to the kids. They were nervous and fired up before the game. "Because of that, we reminded them not to come out too high at the beginning of the game. We wanted them to avoid peaks and valleys and play 'on the rise' all game. It helped that whenever we had a setback, some kid would step up and make a big play for us." The best example was junior running back Ian Keys, one of the fastest 100-meter track men in the Gem State. After Jerome cut its nine-point deficit to just 28-22 on a 44-yard field goal by senior Mike Mercado with 3:48 left in the fourth, Jerome elected to kick off deep instead of going for an onsides kick. Keys initially mishandled the kick, setting him back to the six-yard-line and enabling the Jerome kick coverage to close in on him. But when Keys accelerated down the left sideline, there was no Tiger to match his speed. He motored 94 yards for the decisive TD. Stilling's Hailey squad has now rushed for 213 times for 1,789 yards in five games (358 yards per game, 8.4 yards per carry). That kind of effort on the offensive side of the ball has helped Wood River win six times in its last seven starts. Lindbloom (a team-high 12 TDs) has 89 carries for 754 rushing yards (8.5 per carry). Wood River's defense was also up to the test, although the Wolverines had their hands full with the passing of Jerome sophomore quarterback Zach Thibault (24-for-41, 292 yards, 13 first downs, 3 TD). Thibault was particularly tough on third downs, completing 7-of-10 for 114 yards as Jerome was a remarkable 10-for-15 in third-down efficiency for the game. Jerome (0-4, 0-2 league) also put up big numbers in first downs (a 22-11 advantage), time of possession (27 to 21 minutes) and offensive plays (87-61). 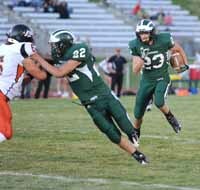 The Tigers piled up 490 yards on offense, compared to Wood River's 608. But Jerome couldn't shut down Wood River's running game that had 177 yards before half, 205 after. And the Wolverine defense came up with three turnovers—interceptions by seniors Chance Larkin and Colton Larkin, and a fourth-quarter fumble recovery by sophomore Gus Conrad while Jerome was on the move. In contrast, Wood River didn't have a turnover. "Our defensive line played hard in the second half. We did better against Jerome's run and pass," said Stilling. But the Wolverines did collect penalties—11 of them for 75 yards in the first half, and just five yards after intermission. Stilling said, "We told them at halftime that we weren't going to win with penalties like that." Early on, it seemed Wood River might not win at all. Riding four completed passes by Thibault, Jerome scored first on an impressive 14-play, 63-yard drive covering five-and-a-half minutes—Thibault tossing his first of two TD passes to 6-5 senior Jake Hollifield (9 catches, 121 yards). But Wolverine senior Trace Tupper, Lindbloom's step-brother, came right back with a 40-yard kickoff return and senior Austin Hafer (7 carries, 77 yards) ran the left end behind Tupper's lead block for 28 yards. Running fearlessly all game, Tupper (48 yards) took a pitch around right end for 14 more yards and Lindbloom dashed five yards for a score. The first of five successful extra points by junior placekicker Trevor Brand gave Wood River a 7-6 lead. Wood River's defense stopped Jerome near midfield and forced a punt. The Wolverines started their longest scoring drive of the night, seven plays covering 81 yards. Lindbloom busted open twice for 45 yards and Tupper connected with birthday boy Connor Braatz on a 37-yard halfback option pass all the way to Jerome's one. Tommy Bailey scored. Jerome threatened to cut into Wood River's 14-6 lead with an 11-play drive that Colton Larkin stopped with an interception on a underthrown Thibault pass on third-and-20. The Tigers got the ball back near midfield just before halftime and Thibault found Kolton Parsons down-and-in for an 18-yard scoring pass and a 14-12 Wolverine lead at halftime. Referring to the success of Wood River's end runs in the first half, Stilling said, "We were running our rockets in the first half and really moving the chains. That moved some of their defenders outside, and as the game went on we started running inside—trying to keep them off balance." On Wood River's first possession of the second half, Lindbloom scooted through a big hole, broke a tackle attempt at the Tiger 31 and rambled 42 yards for his second TD of the night and his second longest scoring run from scrimmage. Jerome answered with a 15-play, 80-yard TD drive covering nearly six-and-a-half minutes as Thibault completed four passes for 46 yards. It cut the Wood River lead to 21-19 with a minute remaining in the third. One of the biggest offensive plays of the game occurred on the first play of the fourth quarter, with Hafer nursing an injury and riding a stationary bike along the sideline. His substitute, senior Braxton Parish, carried a pitch around left end for 26 huge yards. Lindbloom did the rest, taking a pitch for 19 yards, a dive for six more and an eight-yard TD run on a clever stutter step, 28-19. Conrad's fumble recovery on a Tupper and Chance Larkin gang tackle stopped Jerome's next drive, but the Tigers got the ball back at their own nine-yard-line and started moving. Thibault completed three passes for 55 yards on the nine-play drive that finally stalled at the Wolverine 34. Tupper swatted down a Thibault pass and Lindbloom almost intercepted. Jerome went for the field goal trying to pull within one score of Wood River, instead of two, and Mercado responded with a 44-yard beauty. But, just when everybody in the stadium thought Jerome was going for the onsides kick, the Tigers kicked it deep. Big mistake. Keys returned it 94 yards and Chance Larkin stopped Jerome's last-gasp scoring attempt with an interception at the Wolverine five-yard-line. "How does it feel to be 4-1?" said Stilling in answer to a post-game question. "It feels great to get a win." Senior king and queen—Stone Sutton and Kaitana Martinez. Senior prince and princess—Sean Sutton and Michaela Rodriguez. Junior prince and princess—Jack Watters and Sydney Tidwell. Sophomore prince and princess—Andrew Graves and Courtney Ballard. Freshman prince and princess—Kole Mauldin and Claire Sauerbrey. See today's Web site for a complete game summary. Wood River, averaging 34 points per game, will bring its high-powered rushing attack to Rupert Friday, Sept. 30 for a 7 p.m. Great Basin clash with the Minico Spartans (5-0, 2-0). Great Basin champion for five of the last six seasons, Minico averages 45.8 points per game including last Friday's 40-12 league victory at Canyon Ridge (3-2, 1-1). The Spartans have won nine of their last 10 games over two seasons. Wood River has played Minico six times without much success since 2004—losing by a combined 236-44 score including 28-0, 41-7 and 34-12 setbacks on the Spartan field. Other league games Friday have Burley (1-3, 1-1) hosting Canyon Ridge and Twin Falls (2-2, 0-1) at home to Jerome. WOLVERINE NOTES—Wood River's current four-game winning streak got fans thinking about the last time a Wolverine grid team won that many games in a row. With the exception of Wood River's three-year glory days of 1966-68 when the Hailey grid team went 26-1 including unbeaten 9-0 campaigns in 1966 and 1967, the only time a Wolverine team has won more than three games in a row was in 1999 for coach John Blackman. That streak was five consecutive wins—over New Plymouth 38-21, Wendell 21-8, Buhl 42-13, Filer 41-20 and Gooding 41-3 en route to a 5-4 campaign.....The last time Jerome visited Hailey for Wood River's Homecoming was in 2002, when the Tigers escaped with a 27-26 victory....Just two years ago, Jerome invaded Hailey and built a 49-0 lead en route to a 62-22 rout on Homer Field....Jerome had won five straight games over Wood River by a combined 208-83 score. The Wolverines last beat Jerome 16-0 for coach Mike Glenn at the Hailey field in 2005. Jerome was 0-9 that year......Ian Keys' 94-yard kickoff return was reminiscent of Mark Jefferson's 95-yard TD kickoff return in 1987 during Wood River's 34-20 Homecoming triumph over Salmon.....It was Connor Braatz's birthday Friday and Gus Conrad's on Saturday. Rushing—Greg Lindbloom 16-212 (13.3 per carry), 4 1sts, 3 TD; Austin Hafer 7-77 (11.0 per carry), 2 1sts; Trace Tupper 9-48, 2 1sts; Braxton Parish 4-36, 1 1st; Ian Keys 3-12; Tommy Bailey 4, -3, 1 TD. Passing—Tommy Bailey 2-4, 15 yards, 1 1st; Trace Tupper 1-1, 37 yards, 1 1st. Receiving—Connor Braatz 2-48, 2 1sts; Trace Tupper 1-4. Interceptions (2)—Chance Larkin 1, Colton Larkin 1. Fumble recoveries (1)—Gus Conrad 1. Kickoff returns—Ian Keys 1 with a 94-yard TD return; Trace Tupper 3-80. Sacks (1)—Karel Kaiser and Connor Braatz 1-5. Tackles (80)—Drew Barsch 14, Chance Larkin 8, Austin Hafer 7, Gus Conrad 7, Greg Lindbloom 6, Chris Carnes 6, Connor Braatz 6, K.J. Savaria 5, Jake Vegwert 4, Karel Kaiser 4, Trace Tupper 3, Braxton Parish 3, Connor Farrow 3, Kevin Cooley 3, Calub Castle 1. Rushing leaders—Preston Miller 14-73, 3 1sts; Jesse Smalley 7-32, 1 1st; Zach Thibault 6-15, 3 1sts; Jake Hollifield 2-8. Passing—Zach Thibault 24-41, 292 yards, 13 1sts, 3 TD, 1 interceptions. Receiving—Jake Hollifield 9-121, 5 1sts, 2 TD; Deion Ortega 8-85, 5 1sts; Kolton Parsons 4-60, 1 1st, 1 TD; Michael Roberts 1-20, 1 1st; Cody Bowman 1-5, 1 1st; Jesse Smalley 1-1. Tackles—Zach Argyle 10, Kendall Lindley 7, Jesse Smalley 6, Michael Roberts 5, Gunner Gridley 5, Layne Lasike 4, Josh Clark 4, Tyler McCoy 3, Damon Zamora 2.